“Therefore be imitators of God, as beloved children. And walk in love, as Christ loved us and gave himself up for us, a fragrant offering and sacrifice to God” (Ephesians 5:1-2). These are the encouraging and challenging verses it was my privilege to preach yesterday. We also had the joy of welcoming 3 new members after the Lord’s Supper. Priscilla and I had been away from TBC for 6 Sundays until yesterday and so many said how much they had missed us. I returned from the last 2 safaris on Monday (3rd.) 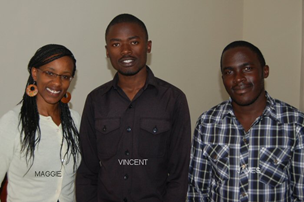 and Priscilla arrived back from UK on Friday morning (7th.). We give thanks to the Lord for His many mercies during these weeks, not least bringing us back together again. This was the furthest from Nairobi, up to 450 miles, first to Mombasa, Kenya’s seaport, then north to near Garsen on Kenya’s largest River, the Tana. Going east from here leads to the famous old city of Lamu which is destined to become Kenya’s second and largest seaport and the terminus of oil and road (even train?) links with Ethiopia and South Sudan. Mombasa. This is where Barnabas Olare, a 1st. year PTC student, comes from. In the last couple of years he has experienced a spiritual revolution moving from the extremist Word of Faith teaching to a clear confession of the doctrines of grace. When he was with us last in July he told the adult Sunday school class about this pilgrimage. The teachings about dominion and positive confession are so common in Kenya. On the Saturday morning he had brought together more than 30 pastors to hear me preach to them from Acts 20:17-35 on Paul’s life and doctrine. Many were appreciative of the delineation of a Biblical lifestyle for pastors and the doctrines of grace, but there is also much opposition as nearly all these men were from a charismatic background. 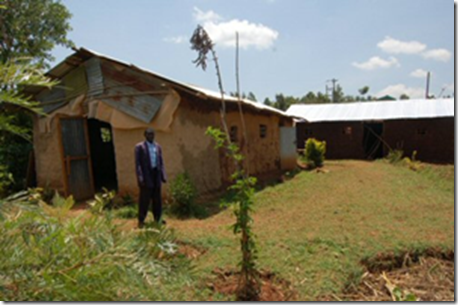 Barnabas’ church building is a typical corrugated iron structure. brought with me from Nairobi, had a good opportunity to talk with him. He professes salvation in Christ. This gave me an idea of ministry which we are considering developing. 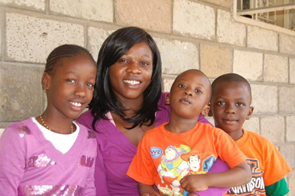 Many of our leaders throughout the country have children in secondary schooling, most of whom we help to support. We would like to bring them together for a camp once a year to give them a sense of identity and to bring the word of God to them. Can we not expect that from such future church leaders will be called by the Lord? Boyani. George Mwanjisi continues to labour here and is seeing some growth with about 30 members. They also meet in their home and I have told him to look for a nearby plot of land which can be for a permanent meeting place, as we are not willing to invest on anyone’s private land. Most of the churches we are in fellowship with are in the west of Kenya and a few of them have secured their own independent registration with the Government. Oyani. 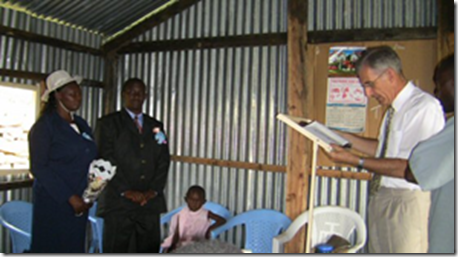 Under the leadership of Fred Lodeki this church is now registered as Upendo (= love) Reformed Baptist Church. Fred invited me to speak at their General Church Conference on Christian Growth, which I did from 2 Peter 3:18 and Hebrews 5:11-14. About 25 were present with others on their way for the weekend. Wath Orango. After more than 20 years this church still meets under the shade as in the picture. With 20+ attenders and 2 leaders they would like to be constituted. I had not visited here for so many years and was encouraged that they had continued on, as their first leader died, and the second defected to SDA. They have always been linked with the Thimlich Church but there is a sizeable river between them and the small boat that used to ferry people across was destroyed in a flood. You can guess the request that was brought to me! Osani. Daniel Ngollo is Pastor of the Osani Trinity Baptist Church. He and Jane have been living together under customary law for 19 years from before they were Christians. We believe it was good to publicly profess their adherence to Christian marriage and we had a simple ceremony with the church building full to overflowing. I had the privilege to clearly point out the vast difference between the cultural and Christian views of marriage and to preach the gospel from Eph. 5:25-27. Although we have been church planting for 30 years in this area this is the very first Christian wedding! Nyakwaka. Sunday morning we were in Nyakwaka, where Caleb Onyango is the pastor. I preached on Eph. 2:8-9 and an old man who had recently retired from a life time’s work in Mombasa kept on repeating that he knows he has now heard the true gospel. May this be his salvation. I was encouraged by the men who had good questions to ask. They were especially concerned why men are trained and yet some of them fail. 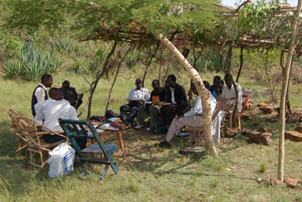 In this area of South Nyanza near Lake Victoria many men have been trained over the years. Thimlich. This is the very first church that was planted out of Nairobi in the early 80s. Leadership has been a great problem here. The first leader inherited a wife and was dismissed, the second embezzled money, and the third has also been suspended as he was suspected of having inherited a wife. This is one of the great ways AIDS is spread and the area has an infection rate of over 25%. I preached to about 10 in the afternoon on Eph. 4:17-32 emphasizing that practical nature of the Christian life. It is encouraging that 2 of the original members have returned though one has gone blind (HIV+?). Walter Otieno is the son of the suspended pastor and they want him to be officially set aside but some are worried because he is not yet married. Nyamanga. This was a Monday so only about 12 adults gathered to hear me preach on Eph. 1:3-14. I was getting near to completion when I started to feel weak and like vomiting so I could not finish! After lying down under tree I felt somewhat better. The leader, Isaac Kelegwa, explained to me his financial difficulties with little or no support from the church. He did not even have money to hire bulls to plough the land ready for planting. We were able to facilitate that so that at least he could expect a harvest. Chebang’ang’. This place is in the great tea growing area of Kericho. 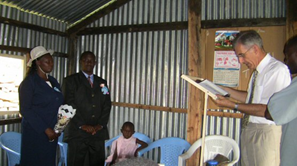 David Ng’etich is one of the Pastors of Glory Baptist Church. 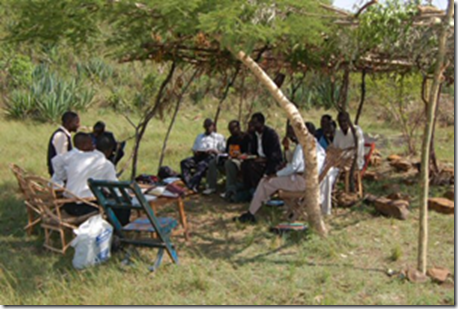 They have church planting work in remote north-west Kenya in Katilu amongst the Turkana (adjacent to Pokot North). We had an encouraging meeting of about 20 where I preached from Eph. 4:17-24. We visited the Assistant Chief of the area who, while claiming to be saved, has not been to church for a year because of the charismatic nonsense going on. We strongly urged him and his family to join with the Glory brethren. His wife promised to attend the forthcoming Women’s Conference, at which over 50 attended. Ndira. We passed through Kisumu to the north of Lake Victoria. This church is now registered under Guilford Park Baptist Church. 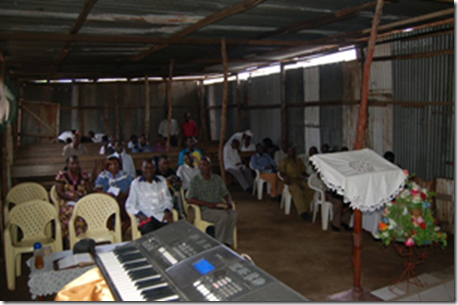 The Pastor, Roy Onyango, had invited me to speak at his midweek meeting on False Teaching, and I took 1 Jn. 4:1-6 as my text. There are the cults, the syncretistic African Christian Churches, and all the extreme Charismatic teachings. I also had the opportunity to urge on them the duty of supporting their pastor and gave them practical ways of accomplishing it although few of them having any salary. Funyula. Here we were just a few miles from the border with Uganda. I found the leader, Simon Ochieng’, quite discouraged. He is dismayed at the way some ‘Reformed’ Pastors act. It was God’s providence for us to come and give him spiritual encouragement. We visited some contacts with him. One lady was quite sick with diabetes, weak and barely able to talk. When I brought 2 Cor. 4:16-18 her face began to glow with joy! The prospect of glory is far more encouraging to the Christian than those common empty words, ‘You will be O.K.’ We went to visit Hezron Oronje in Matayos near Busia who is so eager to begin the PTC next year. We were so encouraged to see what the Lord has enabled him to do in church planting by hard work without relying on outside help. We think the latter is a problem many of our pastors have. Siaya. We spent the last Sunday here. Siaya is the place where we had to seek a court injunction against the Pastor to prevent more violence, and who has subsequently died. Under the leadership of Charles Abwok and his 2 Deacons the church is slowly growing again and there are usually 15-20 adults present. There is an unfinished permanent building and they are making plans to do what they can to work on it and then we will seek to come in for larger projects. Continued blessing and unity in the church. Wisdom in purchasing a newer car. Teaching of the 7 PTC students 12-19th. September on The Doctrine of Man & Sin. ‘Meaty Forum’ on 14th. September with the theme ‘Blessings and Curses’, where we will examine the Prosperity Gospel and the Deliverance Movement teachings. 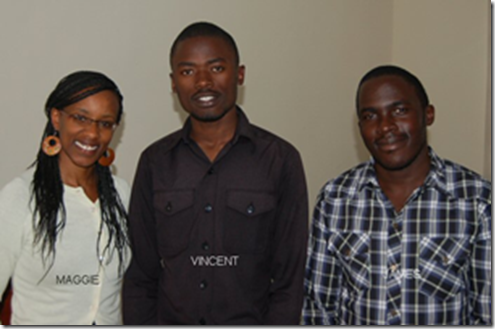 Wedding of Manases to Diana in Eldoret on 22nd. September at which I will be officiating. We continue to thank the Lord for your fellowship in the gospel. Please do continue to pray for the Word to be powerfully preached. This entry was posted in Keith's Updates by kunderhill. Bookmark the permalink.